Northborough – Prestige Home Mortgage, located at 6 Maple Street, Suite 202 in Northborough, has been in business since 2006. Owned and operated by John Lucas and Wesley Oliver, it is a full-service independent residential mortgage provider. 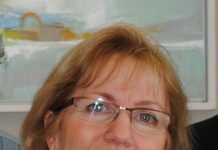 “The unique thing about us is we are a mortgage broker and what that means to our clients is that we work for them, not necessarily any one bank. We write business with about 30 to 35 different lenders so we take that customer and take a look at their unique situation and place them with a bank that will best meet their needs in terms of product including rate shopping. It’s really one point of contact,” explained Oliver. Their range of products include at point of purchase to refinance to construction lending. They pride themselves on matching the right loans with the best rates, terms and costs-to meet their clients’ unique needs. Oliver also shared that they have access to government programs that local banks might not offer. The types of loans they provide include a traditional 15 or 30-year mortgage with fixed rates as well as hybrid and adjustable rate varieties that offer a bit more flexibility for their customers. Part of their customer service includes providing regular loan updates throughout the lending process as well as timely progress reports so their customers know the status of their loans at all times. 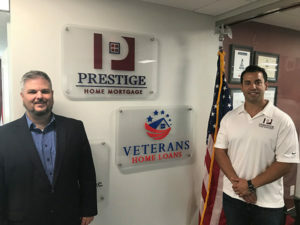 Lucas noted that Prestige Home Mortgage’s sister company, Veterans’ Home Loans, was formed a year ago. The company serves as a local resource for military veterans who want to sit down face to face with someone who can offer a competitive product with competitive rates with minimal fees. Oliver’s dad is a Navy veteran so Veterans’ Home Loans is personal for him. As such, he is passionate about being able to help veterans achieve their dreams of home ownership. 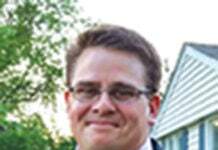 “We want to educate veterans about the best loans out there… We are also going to put on some recurring monthly seminars for first time home buyers and veterans starting in October,” Lucas said. To learn more, visit https://www.veteranshomeloans.com. With Prestige Home Mortgage, clients can choose to meet with a professional in person, or they also have the option to go directly through their website to apply online if preferred depending on their preference. They even have a Smartphone app available for customer convenience for all pre-approved buyers. For more information, visit Prestige Home Mortgage at www.prestigehomemortgage.com, call 800-960-7107 or at their local office 508- 366-4006 or email [email protected].